Georges Jeannin was born in Paris in 1841. He was a pupil of Vincelet and went on to be a most prolific and popular flower painter. Known for his still lifes, Jeannin debuted at the Paris Salon in 1868 where he exhibited regularly. The French State bought many of his flower paintings. In conjunction with A. Cesbron he decorated the Salon de Passage in the Hôtel de Ville in Paris. He was the chairman of the Societe de Peintres de Fleurs and he was conferred with the award of Chevalier de la Legion d’Honneur in 1903. This is the highest honor that a civilian can be awarded in France. 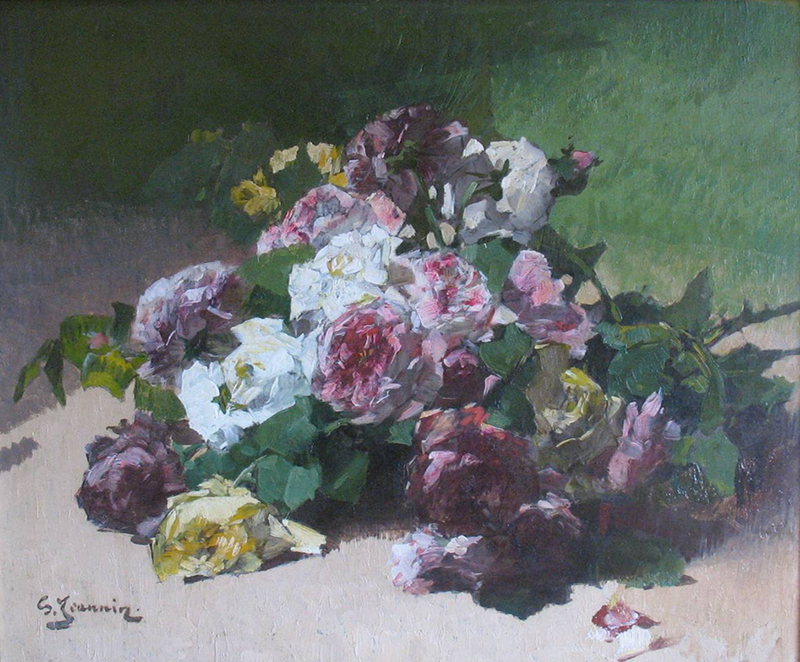 Many artists devoted their artistic careers to still life painting including Georges Jeannin, Eugène Claude, Madeleine Lemaire, Eugène-Henri Cauchois, and Henri Fantin-Latour. Still life painting had a long history of providing decorative details to a home and since a new class of bourgeois with new money had been gaining more status in society, there was a surge in the interest of interior decoration and pictures such as those provided by these artists satisfied their desire for a unified and beautiful interior decorating scheme.